Oscar Valdez’ long awaited ring return will now take place a little later—and a lot farther from home—than expected. The unbeaten featherweight titlist was slated for a January 12 homecoming in Tucson, Arizona—as previously reported by BoxingInsider.com—but those plans along with the entire show have been scrapped altogether. Valdez’ scheduled opponent, Spain’s Andoni Gago was unable to secure a travel visa in time to make the trip to the United States. An inability to secure an approved opponent within the Top 15 featherweight rankings for the World Boxing Organization (WBO)—whose title Valdez has held since July ’16—prompted the Top Rank brass to cancel the entire event. The show would have launched the 2019 season of Top Rank Boxing on ESPN. That honor will now shift to the January 18 bill in Verona, New York, topped by heavyweight Bryant Jennings in a dangerous crossroads bout versus unbeaten Oscar Rivas, which will actually stream on ESPN+. As for Valdez, he will still remain a part of the first show of 2019 on ESPN’s flagship network. His ring return is pushed back by three weeks, as he will land on the undercard of a February 2 show in Frisco, Texas. His bout will come in supporting capacity to the light heavyweight title fight rematch between Eleider Alvarez and Sergey Kovalev. 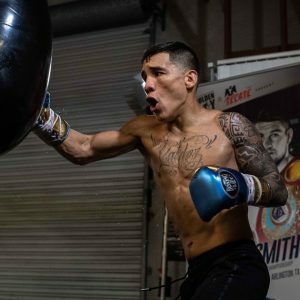 The show comes on Super Bowl weekend, which will leave Valdez (24-0, 19KOs) inactive for 46 weeks by the time he enters the ring for the 5th defense of his featherweight strap. The extended break largely stems from his recovering from a broken jaw suffered in a gutsy 12-round win over Scott Quigg this past March in Carson, California. It also gave the unbeaten boxer—who turns 28 later this month—time to reassess his career and the direction in which he wishes to take it. Such self-evaluation led to his moving on from longtime trainer Manuel Robles as he is now training with Eddy Reynoso, best known for his work with reigning World middleweight champion Saul ‘Canelo’ Alvarez. The shift in location will mark Valdez’ seventh career bout in Texas. His previous six appearances have all ended in knockout, his last coming in a 3rd round stoppage of journeyman Jose Ramirez in April ’15. He’s since been steadily rotated between Las Vegas, Southern California and Tucson, the latter representing his second childhood home, having split his youth between Arizona and Nogales, Mexico. Valdez still has family and plenty of fans in Tucson, drawing a favorable turnout for his Sept. ’17 decision win over Genesis Servania. Early indications suggested an even greater reception awaiting his next trip home, but that adventure will have to come another day.